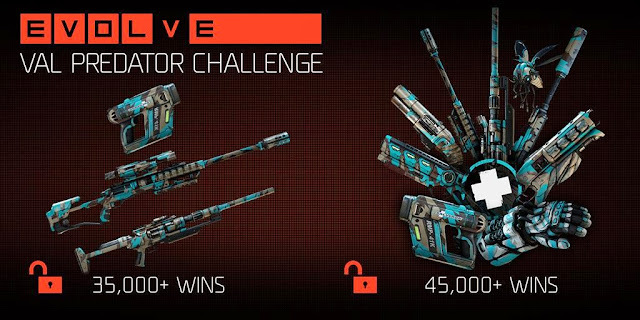 New Evolve Challenges for the Weekend again, more skins to be won! 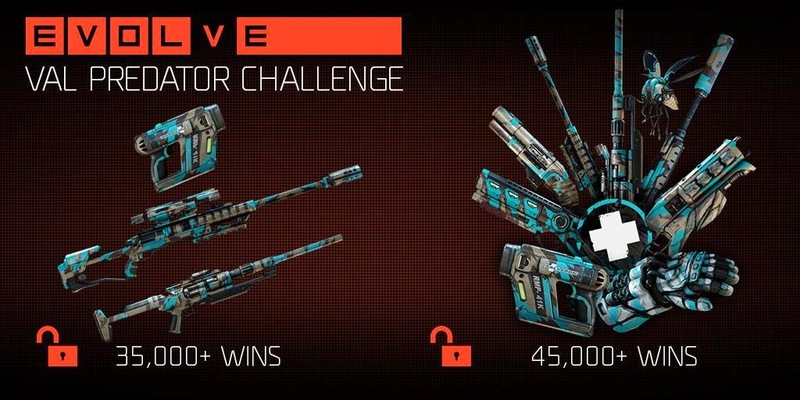 On the consoles, we have the Val Predator Challenge..
"This weekend, between 12:01 AM ET on Friday, May 15 and 12:01 AM ET on Monday, May 18, all Evolve games with Val in the lineup, count towards the challenge. If teams with Val win a total of 35,000 games, everyone who plays between those days and times will earn the Val Predator skin shown above, absolutely free. But that’s not all: if the community blows past the goal and wins 45,000 games with Val in the lineup, everyone who plays between those days and times also earns the entire Medic Predator skin set, also shown above, absolutely free." The community hasn't been doing well, in regards to the Secondary challenges. We have always hit the Primary Goal but come out short in earning the full skin set. This one looks a bit easier so let's do this guys! And for those on the Hunters' Quest Mobile Game.. Things have become a bit tougher now.. The Top Tier of prizes used to be for the Top 1500 players.. it's now only for the Top 500. Came dangerously close to dropping out of the Top 1500 last challenge so got to really buck up this weekend. Hank is my favourite Hunter so not going to miss this one. The Hank Skin for Evolve will be unlocked for the Top 3000 players but only the Top 500 will unlock the skin for the Mobile game as well. Already started playing as soon as the Challenge started.. There was a stupid bug that made me lose points instead of gaining them so gotta play hard this weekend. I know my obsession for free skins can get a bit ridiculous but it's Hank! Once again, if you share my obsession, you can refer to my database of all available Evolve Skins..